I am a 20 year old who was born with a dislocated hip. This left me with a bad hip and 7 inch shortness in my left leg. I have just had a total hip replacement and lenghthening at the same time. For the first time in my life I am even in both hips and it has been 8 weeks since my opperation. The problem I am now facing is that I am still walking the same way I was before the operation. I am still wallking with a limp because I don't know what straight is. Can a Pilates program teach me how to walk properly like everyone else? Physio Therapy is helping but I feel there has to be something else. Hello Anna and Congratulations you are on your way to walking tall and confident again! It will definitely take time and be a life changing process for you to walk straight again, but you will succeed, I am positive. Pilates can definitely help your walking pattern. For one thing, Pilates will help with your upper body posture by strengthening the core muscles that will bring you back to your center of balance and allow you to walk with strength and confidence. 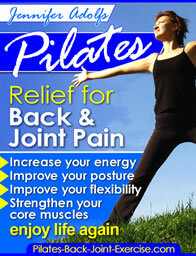 Work on Pilates Side Kicks to bring your hips back into balance and then strengthen the muscles around them. These can be progressed to standing later. Try also the Pilates Leg Circles to strengthen and lubricate the hip socket. These can also be progressed to standing, doing them in front, side, and behind you keeping your balance. The Pilates Bridge or Pelvic Lift is also important for pelvic stability and alignment while balancing the hips. This exercise can be further progressed by lifting one foot at a time off the floor, and/or doing toe and heel lifts. You can find all of these and more exercises and progressions in my Newly Revised Pilates Ebook here. Try finding a Pilates Studio near you and work one on one with a Certified Equipment Instructor. The Pilates Reformer and Wunda Chair would be very beneficial in your rehabilitation.